Each completed form is stored (result entry) within the Formdesk database until the owner of the account or the form, remove the result entries. Formdesk provides several options but it always concerns a manual action. In many cases the result entries can be removed after the form has been completed. For example a contact form or an order form. Our experience is the removal of result entries can often be forgotten which can lead to reaching the quota for maximum number of stored results for the subscription plan. You have the option for any form to set the number of days after which the result entries will be removed. 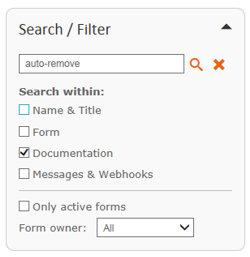 This option is at the moment only possible by adding an ‘auto-remove tag’ within the documentation of a form. Each night the removal actions will be executed automatically. For example if the number of days is set to 0 then every night all new result entries will be removed. If for example the number of days is set to 30 then every night only result entries older than 30 days will be removed. Only the result entries with status ‘completed’ will be removed. 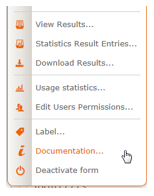 Choose the Menu option ‘Documentation’ for the form you wish to include the ‘auto-remove tag’. The documentation page will be shown. If any documentation was already included then you can add the ‘auto-remove tag’ on top or at the bottom of the documentation page. You can always change the number of days or remove the tag altogether later on. You can do a Search within ‘Documentation’ based on keywords ‘auto-remove’ and all forms will be shown which have the ‘auto-remove tag’.